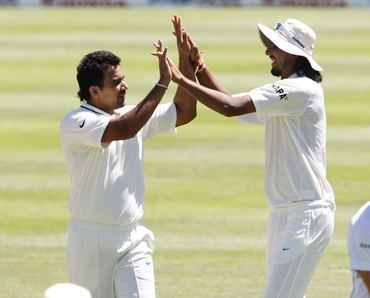 India's Gautam Gambhir and Sachin Tendulkar might have restored the balance in the match with their spirited batting but injured South Africa all-rounder Jacques Kallis feels the momentum is still in the home team's favour in the ongoing third and final Test in Cape Town. 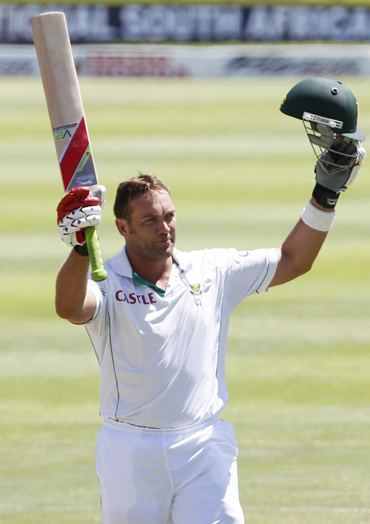 Kallis, who has injured his rib-cage during the brilliant 161-run knock, which guided guide South Africa to 362 in their first innings, will not take the field but will bat in the second innings if needed. "I think it (momentum) is still in our favor. We have runs on the board and that gives us advantage," said the right-hander, who scored his 39th ton and joined Ricky Ponting as the second highest century-getter in Test cricket after Tendulkar. Gambhir (65 not out) and Tendulkar (49 not out) rebuild the innings with an unbeaten 114-run third wicket stand to guide India to 142 for two after the visitors were reduced to 28 for two at one stage. Kallis, who was missed by his team in the slip cordon, said that the fielders, need to pull up their socks after Gambhir was dropped twice behind the stumps. "(Lonwabo) Tsotsobe was unlucky as few catches were dropped off his bowling. We have to catch whatever comes our way. If we can knock off 2 or 3 quick wickets on day three we can put their batting under real pressure. "I think along with fast bowlers Paul Harris will play an important role. Generally, at Newlands the ball does something especially in the morning. So the first hour is important," he said. Kallis was clearly the show-stopper as he defied pain and teamed up with tailenders to take South Africa beyond the 350 mark after they were down 283/3 at one stage. "I think knowing your off stump and leaving good balls was crucial. Knock like this gives me immense pleasure. It is a big match and played under testing conditions, so test of your skills are at complete display. "I think Paul Harris and Tsotsobe (down the order) really fought well and because of them we could reach this total," he said. He also complemented the Indian bowlers for their superb show. "They (Indian bowlers) bowled well throughout. They were bowling in right areas and that made all the difference. They asked us questions all through our innings. Our bowlers have to do the same thing. 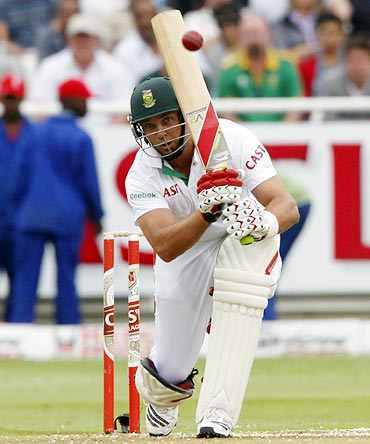 They have to hit the ball in right areas," said Kallis. Kallis also said even though it seemed the Newlands track has eased out considerably, it still has some something on offer for the bowlers. "It (the pitch) eased out a bit because of sun coming down heavily but I believe there is still enough for the bowlers in this wicket. Oddball is taking off from good length. So I think our bowlers can do the job for us," he said. "I love to play on this ground. It is one of the truest wickets to play cricket on. I grew up watching cricket here at Newlands as kid. Wicket here will give something to the bowlers and at the same time if a batsman applies his mind then he can bat long and get plenty of runs," he added.